WOW, we're 2 weeks into the new year and today it finally hit me...it's 2010! The past 10 years have been an absolute blur...so much riding, going so many places, meeting so many new faces. Gotta love it! 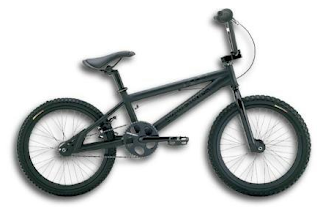 10 years ago I was riding a matte black Robinson Ruckus with 14mm 48's, a 44T GT diamond plate sprocket, Torker tubular 3 piece cranks, Primo Super Tenderizer pedals, 4 Primo Stogie pegs, Volume MadDog bars cut to like 20", the original Odyssey Dirt Fork, and a Primo Hemorrhoid seat. That beast topped the scales at around 45 lbs! I'd love to see one of you trendy little chicken leg, girlie pants wearing, brakeless, big bars weiners (We still love you Brandon!) try to pull a hop 360 or hop whip on that bike! Not happening! Here's to the days when baggy pants and cro-moly ruled the BMX world! Not my exact bike, but that's the stock Ruckus. Look at those damn drop outs!!! Primo - Made in Taiwan from Playmobike.com on Vimeo.